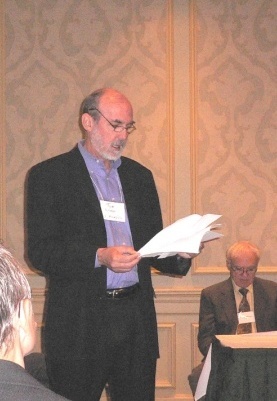 Thomas Nenon, President of the Center for Advanced Research in Phenomenology, Inc., presents the Ballard Prize to Professor Seebohm in absentia. Thomas Seebohm’s comprehensive study Hermeneutics. Method and Methodology (Kluwer, 2004) is an impressive book with three distinct parts. In the first part, Seebohm provides an informative overview of important developments in the history of hermeneutics, first as a technique, then later as a general theory of understanding, and finally as a fundamental-ontological philosophical theory about being and language as a whole. 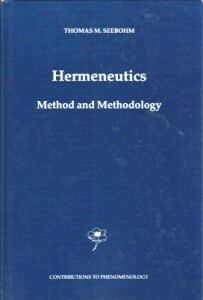 This very rich, occasionally somewhat dense, and always insightful story about how hermeneutics has evolved over the past couple of millennia prior to its transformation in the twentieth century into a philosophical direction is followed by Seebohm’s own proposal for a way to think about the various kinds or levels of understanding. This is the second part of the book. There he distinguishes and describes what he calls animal understanding from elementary understanding, this in turn from higher understanding, and then finally all of these form the kind of systematic and methodologically reflective understanding that is sought by scholars as part of a project of interpreting written or archeological vestiges of earlier societies and civilizations. He is careful to distinguish between those two different kinds of vestiges because one of his main messages is that not all kinds of understanding are linguistic or about linguistic entities, and he maintains that many recent misconceptions about hermeneutics, philosophy, the social sciences, and the humanities come from the mistaken assumption that language in general or dialogue more specifically provide appropriate models for all other forms of understanding. He also provides very close and thoughtful analyses about the specific role that written texts play as the foundation for historically oriented scholarly studies. Finally, in the third part of the book, Seebohm dissects some of the common understandings of what he calls the two canons of 19th century hermeneutics as they have been received and developed in twentieth century philosophical hermeneutics, deconstruction, and other literary theories and tries to sort out the legitimate issues they raise from the pseudo-problems that in the twentieth century were taken to derive from them. This sketch of the topics Seebohm treats is not exhaustive. Although this book is a work “about” hermeneutics, it is most definitely a work “of” and “in” phenomenology, tackling the question of “objectivity” in interpreting past texts by turning, for instance, to the essential laws governing a consciousness for which something “past” can be given and to the essential differences between “fixed” life expressions such as texts and “unfixed” life expressions such as oral discourse, as well as by sorting out the order of necessary generative foundations for this type of interpretation per se. Thus this is a truly Husserlian work, not in the sense of dealing with Husserl’s own position(s) on this or that philosophical issue, but in the sense of building on Husserl’s own concrete investigations (especially concerning passive synthesis) and applying Husserlian methods to new areas. This is, in other words, not only a fine work of scholarship, but a brilliant example of phenomenologizing in action. Moreover, Seebohm’s entire enterprise in this work is thoroughly consistent with Ballard’s views on the importance of the linguistic arts: although in an essay relating the liberal arts to phenomenology, Ballard mentions grammar, rhetoric, and logic (the arts of the trivium) without explicitly discussing methodical and methodological hermeneutics, surely the development of a disciplined hermeneutical consciousness—and correlatively, of a discipline that not only strives to produce responsibly warranted interpretations, but reflects critically on the legitimacy of its own principles and procedures—furthers and deepens Ballard’s vision of the liberal arts as truly liberating (and the possibility of methodologically-grounded objectivity in text-interpretation can also be seen as a step toward healing the rift between “sciences” and “humanities,” a matter also of great concern to Ballard). This is why Seebohm’s Hermeneutics: Method and Methodology is a worthy recipient of the 2006 Ballard Prize.